It’s been a great week here. First, my trusty IT guy was able to resurrect my PC and we bartered for its safe return. I got off fairly cheap, but I’m sure he’ll need a supplemental favor down the line. I was also able to catch up with a good friend of mine, although I was sad that he was lounging at Pebble Beach while I was watching the snow fall. And finally, I finished an enormous consulting engagement, so it’s officially time to celebrate with a glass of wine and some invoice generation. Now that the big project is off my plate, my HIMSS planning is officially in high gear. I looked at the options for focus groups and can validate what Mr. H said previously about the HIMSS websites still displaying HIMSS14 or HIMSS15 labels. Certainly there is an intern who can take care of that for you? I declared my interest in several different options and hope I’ll get to attend at least one of them. Some of the options were thinly-veiled marketing opportunities, but several looked to be educational as well as a way to share experiences with other CMIOs. Although some focus group sponsors are transparent, others aren’t quite so obvious and it was fun trying to read between the lines and figure out who was paying for breakfast. I’ve also started receiving an uptick in HIMSS-related mailings. Some are engaging and others are pretty dry. My favorite this week is from PC Connection. They’re mailing playing cards for you to bring to their booth and use to play blackjack. Mine was an ace, so we’ll have to see how it goes. HIStalk sponsor Imprivata is encouraging attendees to “Get Charged Up for HIMSS” by sending Starbucks gift cards along with an offer to receive an engraved portable charger by scheduling a meeting in the booth. Too bad I’m registered for HIMSS as my real self, because having one that says “Dr. Jayne” would be too funny. 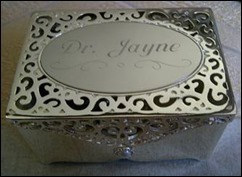 One of my dear friends, Bianca Biller, gave me an engraved box for storing my pearls. Fortunately, she warned me to open it under the table at my hospital “send-off” party. I have a photo of Jonathan Bush and Judy Faulkner talking to John Glaser at HIStalkapalooza. I won a giant three-foot-tall chocolate bunny from Medicomp, and yes, even though we needed to freeze a majority of it, had an unsuccessful fondue night with some of it, and tried to give it away, we finished the giant bunny. I once conspired to take over an empty HIMSS booth and re-brand the company when their booth sat empty. Matt Holt doesn’t know if I am friend or foe. I like it that way. I think he does, too. Incidentally, the reader sent me real-time photos of the giant bunny when he decapitated it with a large kitchen knife, so I know he’s a contender. I’m not sure who we’ll be competing against yet. We still need two more team members. A couple of potential candidates weren’t willing to commit to the time slot (Tuesday at 11), so I’ll have to put them in alternate status. You still have time to send me your top reasons for why you want to be on Team HIStalk. Several readers have already started sending me pictures of their #HIMSShoes and this will be a great opportunity to show them off. If you can’t make that time slot but want to play Quipstar, you can register for other show times. ONC launched a new blog series about permitted uses of Health Information under HIPAA. The first one is titled “The Real HIPAA Supports Interoperability” and should be required reading for all the hospitals blocking release of information where it is clearly permitted. The series runs every Thursday through February 25. Are you getting ready for HIMSS? What are you most looking forward to? Email me.